Everything looks better with flowers… So whether you’re celebrating the birth of a child, the kindness of a friend, the closing of a business deal, or sending your condolences, flowers from Sylvia’s Floral & Gift Shop make any occasion Extra Special! Sylvia’s Floral & Gift Shop serves Ecorse and the surrounding areas as your full service florist. Our highly trained customer service staff is ready to assist you with placing orders for local delivery or anywhere in the world. Not sure of what to send? We'll gladly help you with creative suggestions! One of the hallmarks of Sylvia’s Floral & Gift Shop is our unsurpassed customer service! Whatever the occasion, let our talented designers create your fabulous floral arrangements. 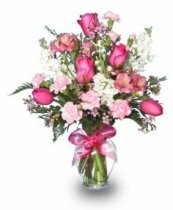 At Sylvia’s Floral & Gift Shop, you can choose from several traditional floral design styles that are perfect for everyday…birthdays, get well, anniversaries or just thinking of you. At Sylvia’s Floral & Gift Shop, we deliver the freshest flowers and brightest smiles! Call us today! When you’re looking for something special, Sylvia’s Floral & Gift Shop has just what you need! What about wedding flowers? Call us in advance to set up an appointment with our expert wedding planner. Consider sending a fruit and gourmet basket from Sylvia’s Floral & Gift Shop – a fantastic gift for any occasion. Don’t forget our vast selection of gift such as Root® candles, Mikasa® crystal, homemade soaps, silk arrangements, novelty gifts, angels, balloons, swags, wreaths, dish gardens, picture frames, singing and regular plush. We accept all major credit cards. Sylvia’s Floral & Gift Shop is conveniently located at 4230 West Jefferson in Ecorse, MI. We are open to serve your floral and gift giving needs. 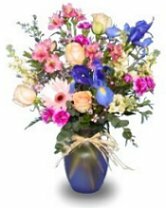 Sylvia’s Floral & Gift Shop delivers to all local hospitals and funeral homes.